Home / "Where do you see yourself in this parable?" 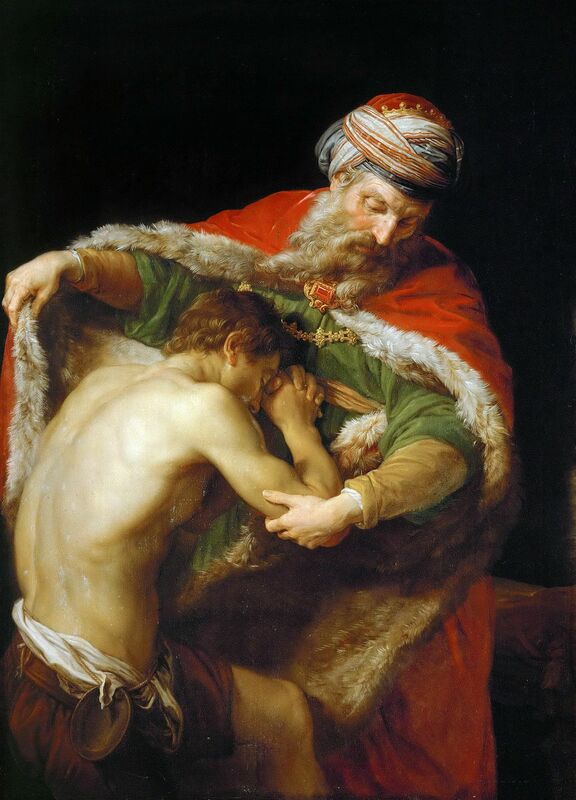 The parable of the Prodigal Son is one of the most beloved passages in the Bible. Ralph Waldo Emerson called it the greatest story in the Bible…or out of it. Charles Dickens agreed. Along with the Good Samaritan, it is surely one of the most recognizable stories our Savior told. I’ve thought about the reasons why this parable should be esteemed by such great writers. It’s not simply because this is a good story (though it is); it’s because the parable is fundamentally relatable. Think about it. I doubt there’s a person here who fails to identify with at least one of the characters in the story: the foolish, selfish son, the forgiving father or the hardworking-resentful older brother. On some level, we can relate. If we give it some thought, we might even conclude that we’ve been all of these characters at one point or another during our lives. So here’s a brief re-cap. As the story begins, a man’s younger son demands to be given his share of his father’s inheritance. It’s a pretty crass thing to do---somewhat along the lines of: “I wish you were dead…but since you’re not, I want what’s coming to me before you die.” It’s a presumptuous act that goes against the norms of family, religion and society. And what does the Father do? He gives his son the inheritance. And upon receipt, this son leaves home for a distant country and squanders all that he has been given in what the Bible refers to as “dissolute living”, the details of which I will leave to your imagination. A severe famine strikes the land—and those among us who long for justice might think that just about now the son has finally earned what has been coming to him all this time. Without money, family or resources he discovers that he has to resort to the most demeaning occupation for a Jewish person—he becomes a herder of pigs in order to survive. In Jewish tradition pigs are unclean animals; and, what’s more, because they were used for sacrifices in Roman and Greek worship, pigs were also associated with paganism and apostasy. So, in other words, not only was he a rotten son, he was also a lousy Jew. In truth, it’s difficult to imagine falling much lower than this. Yet, as bad as it undoubtedly is, this young man is not completely lost. He realizes that though he has forfeited his claim as his Father’s son, if he can simply manage to get back home he can ask his Father to at least let him become a hired hand. The young man repents and confesses his sins against God and his father as he turns homeward. In the meantime, the father awaits the possibility that his wayward son may someday return home. And, as soon as he sees the young man approaching the father is “filled with compassion” and runs to him—an unusual act for a dignified elderly Jewish man. Tradition would have held that the father remain seated or standing where he was, and the son would come to him. In other words, the father’s response was extraordinary—and perhaps, to the listeners, unseemly. He embraces and kisses his son as a sign of forgiveness. It’s worth noting that the Father does this before the son repeats his earlier confession. The Father embraces his son before he hears the apology we all would agree that he deserves. And in celebration of this long-awaited homecoming a fatted calf is killed and rejoicing begins. Now, the focus of the story turns to the older brother who hears the sounds of celebration as he comes home from working in the fields. And, can we blame him when we hear that he is angry when he learns the reason for the festivities and refuses to go in and take part—because, really, ask yourself, how would you have felt if you had been in his shoes? The Father goes out to welcome his elder son and pleads with him to come in. But the son, with great bitterness asks why such a party was never given for him. And, (here’s the thing)…this older brother he’s right…isn’t he? In almost every possible way, he’s right—about his brother, about himself, about his ridiculously permissive and forgiving father. However, the father does not rebuke his elder son for his resentment (as he has every right to do). Instead, he insists: “You are always with me, and all that is mine is yours.” This father…he has compassion for both of his sons, and extends mercy to them in equal measure. So…What does this parable say to us? And how do we live it out? And now the real question…the one which puts the spiritual rubber on the road, so to speak. If God is like the Father in this parable—lavishing his love, grace, forgiveness and compassion upon those who don’t deserve it (namely, ourselves), what do you imagine we are called to do in our own lives? If you’ve been forgiven of your failures by God—what do you think God expects you to do in return? How should you respond to the people in your life who haven’t earned forgiveness—and maybe don’t even deserve it? How do you embody the call to reconciliation? St. Paul, in the epistle reading for today encourages us to be ambassadors for Christ—agents of reconciliation. Who are you? Are you the selfish younger son, the resentful elder brother or are you the one who strives to be like Christ, opening his arms to receive us all. Ask yourself, with whom do you need to be reconciled in order to live into the higher calling of Christ? And, now….go out and do something about it. In Jesus’ name. Amen.